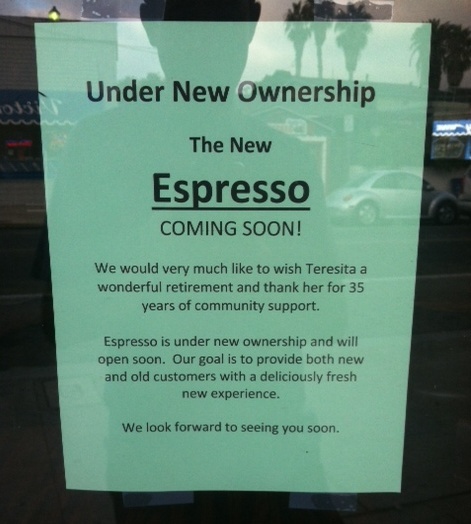 The green sign on the glass door at Espresso Pizza said it all.”Under New Ownership”. Arguably, the best pizza in all of Ocean Beach came out of the ovens at Espresso Pizza on Sunset Cliffs Boulevard. For 35 years Teresita – the owner/ manager – ran the place, and her staff of chefs and cooks and servers were with her nearly that entire run. Apparently, Teresita has retired and has sold the business to Chris Stavros, the owner of the Olive Tree Market – in the same building. Word on the street is that Chris is keeping the name and remodeling the inside and menu, but definitely wants it to be a pizza spot. There is also a rumor that the new owner wants to keep the chef and wait staff who have been very dedicated for so many years. Thanks for the hat tip. 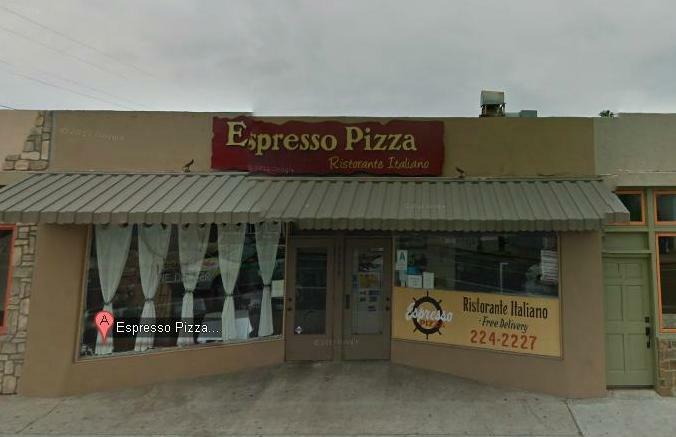 Remember my review several months back – some of the readers took me to task – you too, as I recall – Pepe’s down the street sure gave them a run for their money, and, in my opinion, came out on top. KEEP VEAL ON THE MENU!!! MUCH better than The Venetian! We will wait for the opening and we always took out the pickled stuff out of the salads and just ordered a regular salad. Maybe an antipasto vs. garden salad as options??? My boyfriend has spent his birthday there (mostly alone) for the last 20 years – can’t wait! Please let me know when the re-opening is planned. Will be your first customers – so glad you are coming back! Spinach and double garlic pizza always the best! Can hardly wait!